Where better to start this blog than with a Welsh writer, with poetry and with an independent publisher. That should give you a taste of where my preferences lie. Grahame Davies is not your introspective Welshman. Despite contributing to Seren’s excellent ‘Real’ series he also recently published a book on Wales and Islam, ‘The Dragon and the Crescent’ (Seren, 2011). Being Welsh seems to be defined not by creating a siege mentality of ‘us v them’ but through a confident celebration of identity that belongs beyond the nation’s edges. I’m not sure if that’s why so many poems at the start of the collection are set on the shoreline, but it’s fitting. ‘Cromer Pier’ with its observations of ‘waiters’, ‘runners’, ‘fishers, ‘walkers’, ‘the old’ and ‘the young, whose only scale is sea and sand’ also ends with the expanse of the ‘horizon’. And this is what follows: the minutiae and the expansive. The minutiae is often made up of individuals’ lives and relationships, often of the life of the poet himself. Whether it be rhyming ‘Proust’ and ‘Llanrwst’ in ‘Remembrance of Things Past’ or ‘Revisiting’ the college in which he studied, there is a tenderness in his consideration of people and places. In a number of poems on books and reading, Davies, like R.Williams Parry before him, is as interested in the inscriptions written inside the volumes he finds in second-hands shops as he is in the books themselves. He senses and observes the richness in the detail. In ‘Capital Bookshop, Cardiff’, he picks up a volume inscribed “Dear John, bought this night he left Cathays” and considers that this is , ‘A long-dead love; no record of it stays/except, on this old bookstall’s bargain stand’. The stress on ‘except’ suggests that it does survive and that the past can never entirely be escaped. And there it is again, the minutiae of the inscription and the expansiveness of the past and of the way people and relationships survive. The latter poem is also in the form of a villanelle and the collection has a number of them. The poet clearly enjoys the form but at times these strain a little and, personally, I found his more conversational poems to be more successful. The girl that ‘stroked the pages like a lover’s hair’ in ‘Final Page’, another villannelle, was too sentimental for me. Indeed, it’s an uneven collection with poems such as ‘Crossroads’ and ‘Hoodie’ seemingly out of place with many of the other poems. Perhaps this is because Davies adopts a persona for these (I presume) and moves away from the personal, observational qualities of many of the other poems. there is beauty, ‘The loved one’s lonely, lichen-covered name.’ The sound of that final line itself implies, despite the loneliness, that the poet’s realisation of these truths is tenderly felt. Just as those poems set on the shoreline are a fitting opening, ‘Doorway’ is a fitting ending to ‘Lightning Beneath the Sea’. The ‘unmarked doorway’, the minutiae, leads to an expansive ‘Palace of Joy’ and the character who leads the poet on calls him, despite the fact that he ‘would have stayed and watched’, to move on as “there’s plenty more to see.” There’s joy to be had in this life, often in the trivial detail, and Davies celebrates it. And he made me, in his best poems, feel it too and made me want to see more of it in the everyday. I look forward to seeing what else he sees. 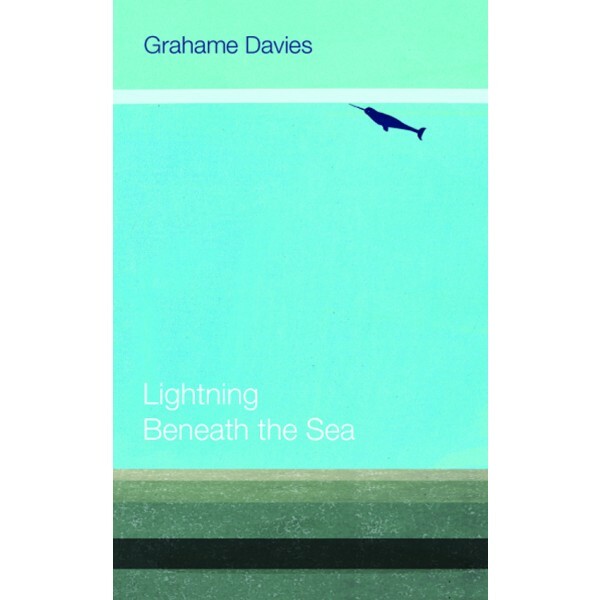 This entry was posted in Poetry and tagged 'Lightning Beneath the Sea', Grahame Davies, poetry, review, Seren. Bookmark the permalink. Grahame Davies sounded familiar then I realised he’s from my hometown and had written ‘Real Wrexham’! Definitely going to have to check out his fiction. I’d already bought ‘Real Wrexham’ for my father last year and was delighted to read this blog. ‘Lightning Beneath the Sea’ – ordered, arrived and currently being devoured dare I mention the convenience of A***on? .